A new year, a new recipe, a new outfit, a new Fuji road bike, or maybe a new….??? So many new things for many people at this time of year. The holidays are done for awhile, the kids are back in school, and for the older peeps, all kinds of “new” things pop up in our heads. Funny how the month of January can send your mind and thoughts into a whirl wind of never ending “new” things! Suddenly our to do lists become more like pages in books rather than just a list on the fridge. And don’t get me started on all the diet commercials on the TV, heck they are on my Pandora stations too! I do have a weird thing for lemons. Lemon everything, I do love lemons! They are a bright beautiful yellow, and can add so much flavor to all kinds of dishes, savory or sweet. I even add lemon to my water every day. My co-workers think I’m a little crazy at times, but hey, that’s me, I love lemons! 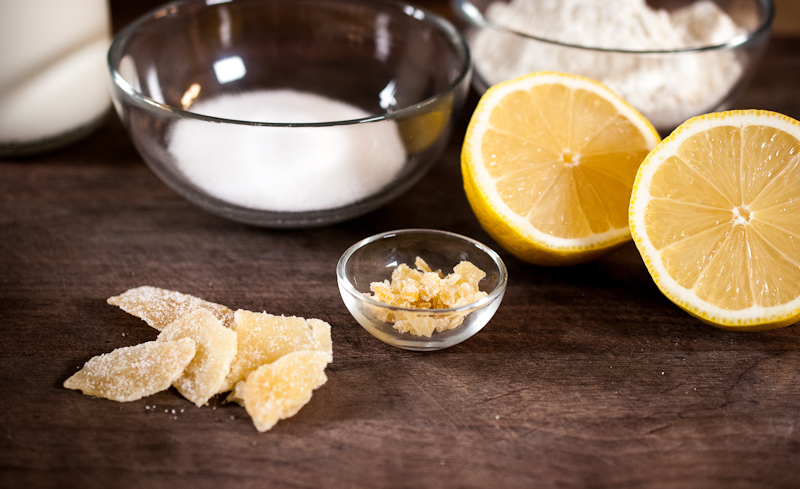 And I wondered, what would happen to candied ginger and lemon together? A tart and zingy sweetness kind of thing happened. Of course, it had to be in a scone…. There is this neat thing about scones, you get a warm one in your hand with a cup of coffee or tea, and suddenly time slows down for a bit. 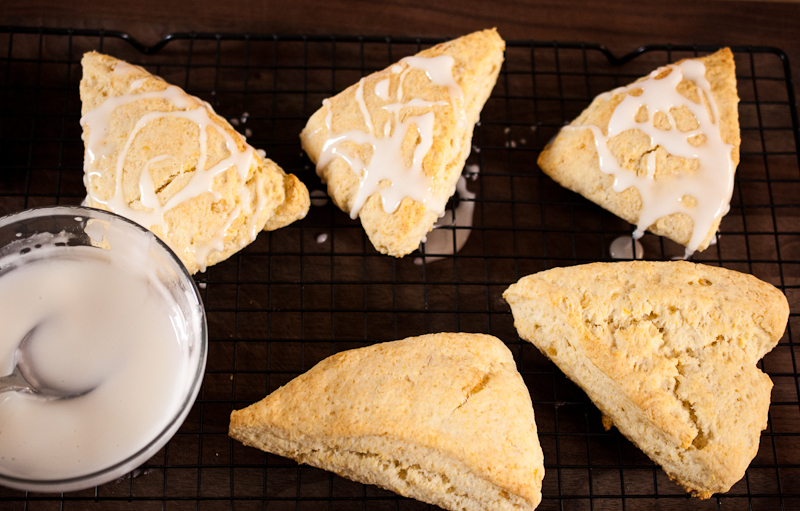 Scones make time stand still, you savour each bite of flaky, biscuit, like taste with sips of coffee or tea. It’s just what they do. It’s a perfect pair for a Sunday morning with a paper ( I know some people out there still read the Sunday paper), or your long commute into work while listening to NPR, or after you take the kids to school and you have a moment of “me time”. 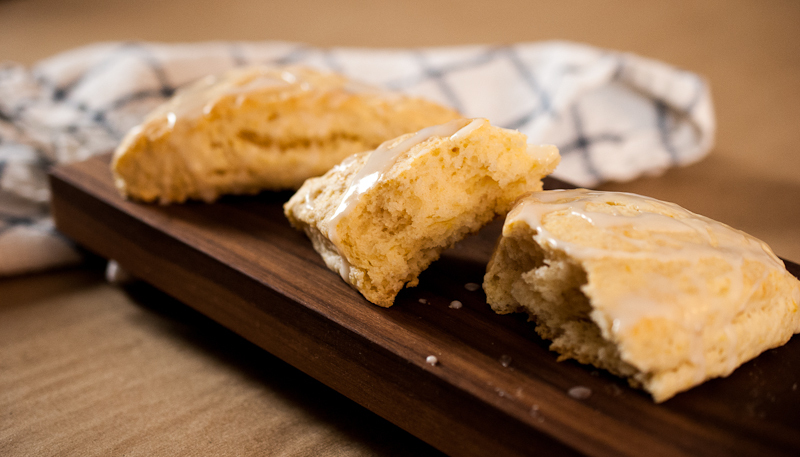 Whatever your daily routine is, add a warm scone and coffee to it, and time is suddenly on your side. They are easier than you think to whip up a batch of these tasty breakfast treats! Mix your ingreidients, knead for a few minutes, shape, cut and into the oven they go, voila! 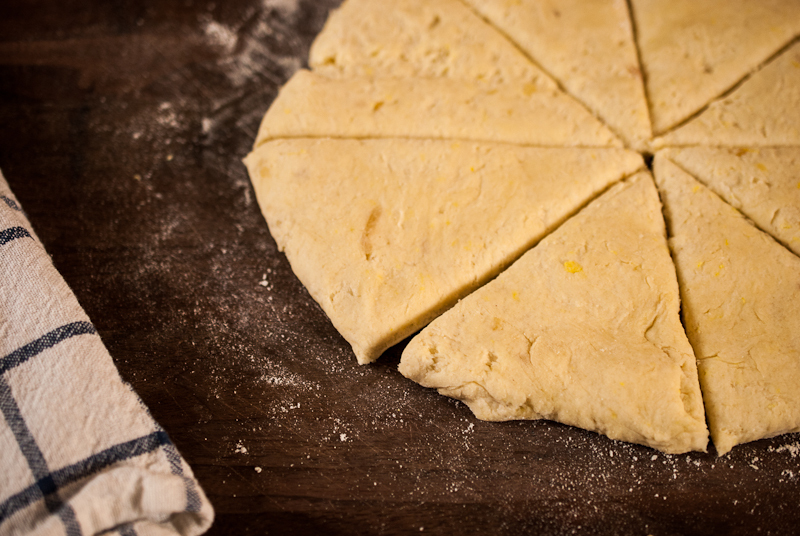 No waiting for dough to rise, just mix, shape and bake! Heck, you could even bake these up while the kids are getting ready for school in the morning. I always prefer a scone over a muffin any day. 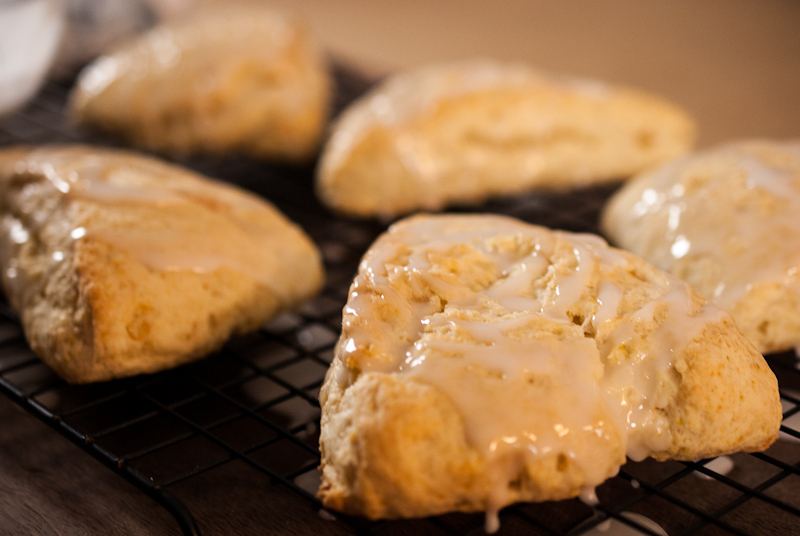 Scones are almost perfect on their own, but for a touch of sweetness, I like to drizzle a little bit of lemon glaze on top. Just a little to add some extra sugar. Like a cherry on a sundae, or extra frosting on the corner slice of that cake, you know what I’m sayin here…. So sit back, relax, let time stand still for awhile while your mind ponders over this New Year, and just let whatever will be…be. In a large bowl, whisk flour, sugar, baking powder, lemon zest and salt together. 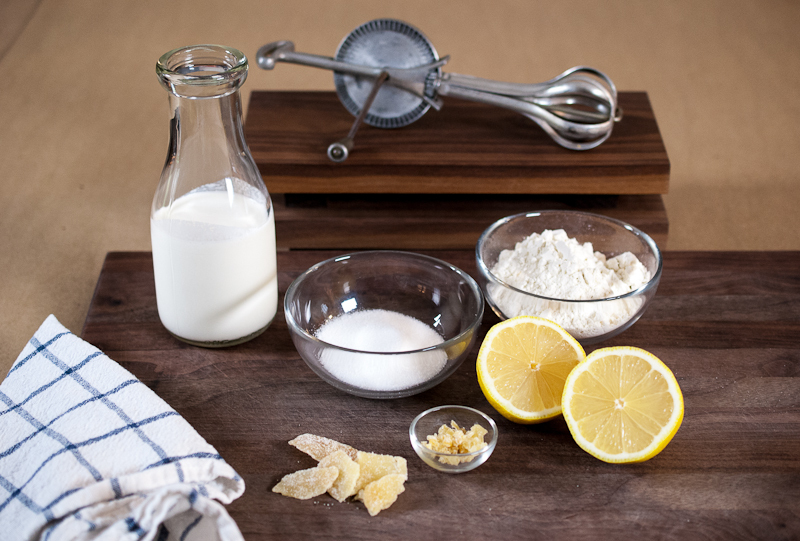 Using a wooden spoon, stir the cream and 2 tsp of lemon juice into the flour mixture. 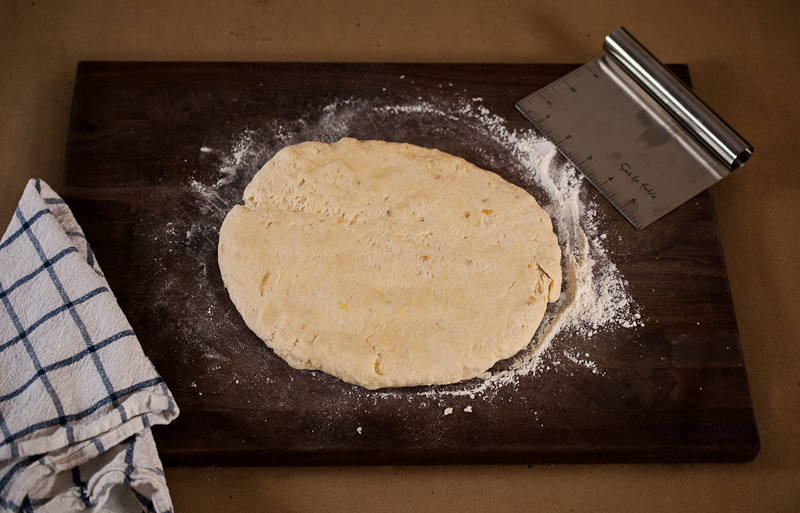 On a lightly floured surface, gently knead dough just until it comes together. Pat into a 9 inch circle, and about a 1/2 inch thickness. Put onto lined baking sheet and bake for 20-25 mins. In the meantime, whisk remaining lemon juice and powder sugar together. Mix to a consistency of a little runny but not to thick. it should drizzle off a spoon. Cool on a wire rack and drizzle with icing. Can you clarify the measurements for the lemon juice and finely chopped candied ginger? 1/4 of what? Cup? Tsp?